To repay a favor, Reuben promises that the Partridge Family will appear at an event. There is one hitch . . . they must back up a beautiful young girl who can't sing a note on key! • This is the first episode of the second season. • Jack Burns was a regular on "The Andy Griffith Show," as well as "Getting Together" with Bobby Sherman. He also co-hosted "The Burns and Schreiber Comedy Hour with Avery Schreiber. • The music stays the same, but the theme song lyrics are changed to "C'Mon Get Happy," written by Danny Janssen. • In early May, while the series was on hiatus, Wes Farrell and the Partridge Family musicians and singers reunite in the studio to start working on songs for "The Partridge Family Sound Magazine." (Although the original title was "The New Partridge Family Album".) The album is released in July. It hits #9 on the charts in September. In August, they start working on "A Partridge Family Christmas Card." Let's see if we can get more people participating in this club, huh? Gord -- where are you?? You're the one that spearheaded this club and you're MIA! Poor Kathy is pretty much here all alone with the crickets. What else would you guys like the see with this section? Why aren'tcha all participating? I love this episode. It's so funny and just about sums up how shallow Keith was:) In fact S2 is my favourite. omg! this episode is so funny what with Keith being tone deaf when it comes to Dora, and the scene with Shirley and her father is hilarious, and the end where she is on stage at the naval base and all these guys could care less what she sounds like.... it's amazing some times how much I can laugh at something that is over 30 years old. Real fun episode to watch. I re-fell in love with "I Left My Heart In San Fransisco" after hearing David sing it a cappalla. I love his voice. And the closing concer when nu-Chris gives up the drums after realizing no one can hear him anyway! I re-fell in love with "I Left My Heart In San Fransisco" after hearing David sing it a cappalla. I love his voice. I just wish he'd recorded and released it as well. David is SUCH an immense talent overall. Like Sinatra, Bennett, Mathis and Como, he's one of the GREATEST crooners of all time IMHO! I think my favorite bit of this espisode was Keith's sneaking ever so carefully into the house, up the stairs and into his room -- only to be confronted by his siblings regarding his inability to tell Dora the truth about her singing. Jack Burns also replaced Don Knotts as Andy Griffith's hapless deputy on "The Andy Griffith Show" for a time. The man's hysterical. And I LOVED that cartoon, "Wait Till Your Father Gets Home"! Too bad it didn't last past the first season. Also Jack Burns was the announcer for the ABC show "Fridays" featuring a unknown Michael Richards (from "Seinfeld") which ran from 1980-1982. My favorite scene, Shirley trying to explain the facts of life to Keith. Great episode, one of my favorites from the second season. 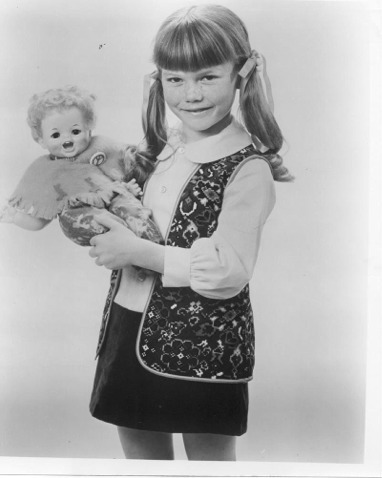 I believe this is also the first time we see Tracy with her "Patti Partridge" doll. She's holding it when Dora is singing the Partridge's garage. No, I didn't say it wasn't Robyn on the songs. I said Jackie recorded "You've Lost That Lovin Feeling."